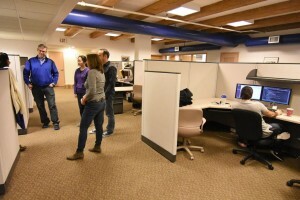 Geek Offices now has 10 work station cubicles available at our Inman Square, Cambridge coworking space. Cubes rent for as little as $215 per person per month ($475 for the first person in your company or group and $150 for each additional member up to a total of 5 individuals). Memberships include 24/7 access, free printing, coffee, wifi, ethernet, utilities, and lockers and showers for bike commuters. If you are a non-profit or startup looking for flexible co-working space, check out Geek Offices, a co-working space offering all the amenities of a professional office with none of the overhead. Technology workers and non profit organizations looking for coworking space in Cambridge or Boston will find that Geek Offices provides some of the most affordable co-working space in the region. Compare Geek Offices to the prices and amenities of executive offices and other coworking spaces in Cambridge and Boston and you’ll be surprised by the value we offer.